Youthful Gemini and authoritative Capricorn will get on each other’s nerves. Both of these independent signs require their space (for very different reasons). Neediness will not be a problem in this relationship, but overall compatibility might. Sun in Gemini is the Peter Pan of the zodiac. No matter how much he ages chronologically, this Mercury-ruled sign will maintain his youthful energy of curiosity and wonder. But he can also have the attention span of a child, as his partner will discover. He’s absolutely capable of committing to a relationship, as long as he has variety in all areas of his life. And it helps if his partner keeps two things in mind; Sun in Gemini intellectualizes everything, and no one (including his lover) can give him everything he needs. Moon in Capricorn needs control. Her security is based on the assurance that she’s “got it covered,” and this includes her relationship. This is not the grabby control of insecurity (although Shadow Capricorn can become a domestic tyrant). She actually needs space where she can tackle a challenge or ambitious project, by herself. But in order to commit fully to her partner (which she will do after much cautious evaluation) she needs to know that he is with her—forever—110%. 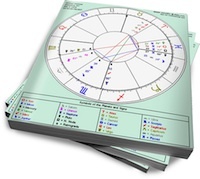 Domestically, Moon in Capricorn is more concerned with organization than nurturing. But no one (with the possible exception of Virgo) runs a tighter ship than she does. Sun in Gemini’s scattered energy will make Capricorn feel uneasy. She may attempt to apply rules to his comings and goings, which will only push Gemini out the door. She’ll find his incessant chatter annoying, and his short-lived interests silly. Moon in Capricorn’s long periods of quiet will be beyond Gemini’s understanding. If she doesn’t attempt to engage him in regular conversation, he’ll spend more time with his friends than he does at home. Neither will be upset at the prospect of doing their own thing. But without more binding and harmonious crossovers between their charts, there will be little reason for them to stay together.